CBD oil explained and about beneficial effects. CBD is a component present in the industrial hemp plant. CBD is non-psychoactive and that is why it does not yield a stoned or high feeling. This non-psychoactive characteristic makes this therapeutic oil extremely suitable for the treatment of adults, children and animals alike. Unfortunately, we are no longer allowed to list information about the effects of CBD oil on the site. Google, however, will yield plenty of information for you. Together with THC, CBD is the most important component of the hemp plant. A lot of positive characteristics that CBD has to offer can be ascribed to this special cannabinoid. We have cannabinoid receptors built into our bodies. Ingesting CBD in your body may help normalize functional systems such as cell communication and immune functions. This means that the systems that make up your body will be able to communicate with each other better, have a better understanding of what is going on, and help to clean up things. It is like a good relationship, where people have to talk to each other and work with each other to keep the house clean. With the cannabinoid receptors in our brains and virtually no other way of ingesting cannabidiol, CBD seems to be the perfect medicine to ensure that our body can work at peak performance. This replaces unidirectional transmission where chronic inflammation is promoted. CBDs mimic the body’s natural two-way communications system. The endogenous cannabinoid system acts as a modulator in fine-tuning many of these systems, and when there is biochemical disruption in a person’s body, it may well be that a cannabinoid system will help rebalance things. Is the use of CBD oil safe? The use is 100% natural and 100% safe. It does not have an addictive effect, nor does it cause dependence. Furthermore, the oil does not produce any nasty side-effects and can be used on humans as well as animals. 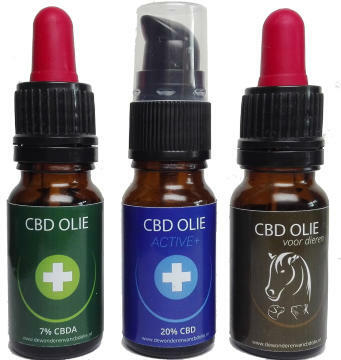 If you are using medication we advise you to always notify your physician or specialist of the use of CBD oil.